When a local turnpike authority decided to replace its toll takers with automated toll technology, it created more than a little confusion as drivers looked for places where they could purchase and load their "toll ticket," transducer.There was also some question about the program kickoff. When our local turnpike agency decided to trash their tollbooths and put up cross-roadway supports, holding multiple digital devices looking down on the many cars that daily passed through the former toll plazas. There was lots of panic on the part of many of the driving public. There were issues, though. No one on the Turnpike Authority ever said such a significant change would be coming until it was almost changeover day. And then the number of sites were drivers could purchase toll transducers wasn't all that widespread or convenient. Somehow, we made it through all of the trouble that the changeover caused, including traffic jams the first few days as drivers who were entering the flow of traffic had to compete for room on the road with folks on the through lanes who weren’t yielding very much. It left everyone who experienced this changeover wondering: there must be a better way. And, it looks like, in my opinion, Audi has found it. The automaker had a couple of realizations. 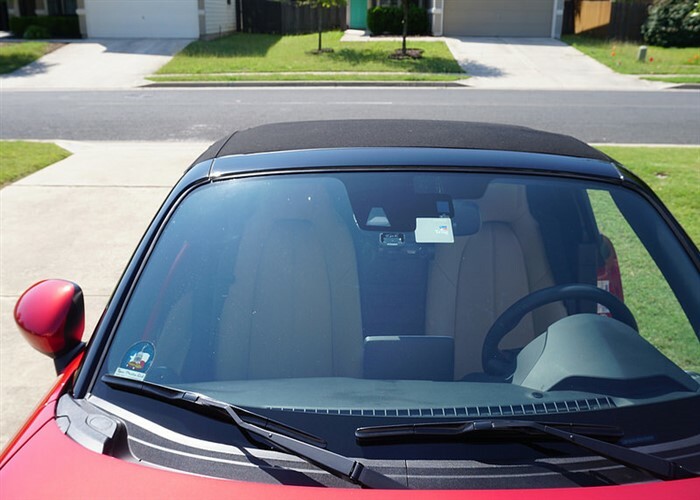 The first is that obtaining one of the transponder units that fit on a car's front windshield can be a hassle. The second seems to be that placing the transponder unit – the piece of electronics the toll system pings every time you drive through a "toll" is not only frustrating, but it can also be dangerous. If you do not find the safest spot, the system may not work at all. Audi, in response to these issues, is ready to launch the first integrated toll transponder system presented by any automaker. Called the Integrated Toll Module (ITM), the new electronics are part of an expansion of Audi’s vehicle-to-infrastructure technology, available on some Audis. Built into the rearview mirror housing, it functions as the independent transponder to connect with toll system. Though there are few technical details available, it seems that the transponder can hook to existing tolling agencies throughout the U.S., Canada, and Mexico. The device can be adjusted using Audi’s Multi Media Interface (MMI) system. The ITM can also be registered to work with existing toll accounts. Audi isn’t alone in this work. Like the Internet of Things that seemingly daily hooks more and more or our every day to the internet, automakers are joining the rush to hook into the IoT. Caddy has integrated vehicle-to-vehicle communication that allows the CTS sedan to effectively “talk” with other connected vehicles on the road to provide drivers with a higher level of safety and warnings. Many automakers are already integrating Amazon's Alexa into their cars, as well. Not everything is rosy. GM drew lots of heat when it introduced its Marketplace app so people could shop from their dashboards while driving. Many sources rapped this feature because it might be a huge distraction, which I believe it will be. ITM will be available later this year, Audi said.